Is Serial the First Mainstream Podcast? Prior to Serial, This American Life consistently topped the podcast pyramid, with a million-plus subscribers each week. Yet TAL also aires live on public radio each week so from a podcast purist perspective, I’m not sure it counts as one. 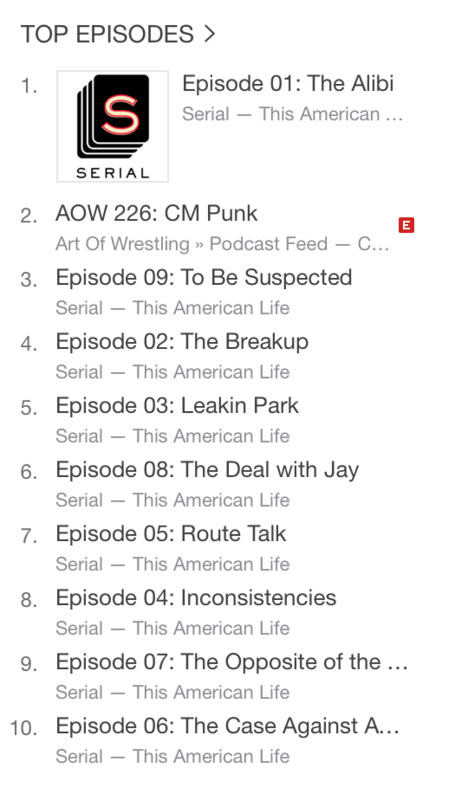 And I’m pretty sure it’d have 10/10 on the Top Episodes if Serial actually had a 10th episode! 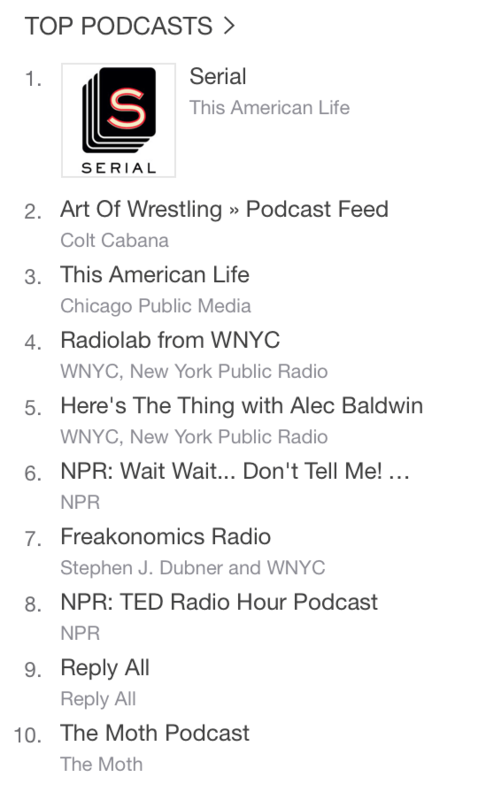 Will We See More Podcasts With This Success? Of course this is a loaded question, although in more ways than one. I’m not even sure I can call Serial a podcast. How is it that different than the radio, or a book on tape? Sarah Koenig, the host, is an alum of This American Life, an NPR run show, so when you’re listening to Serial you’re essentially listening to NPR in a sense. And the episodic nature of the show makes the listener feel like each week they’re listening to the next chapter in a book. So even though it technically is a “podcast,” it’s not really a podcast. Or rather, the fact that it’s a podcast isn’t what makes it special. And if not that, then what is it? Serial – is really just a well-told story. We may see more podcasts with this kind of success, but it won’t be because they’re delivered to users via an RSS feed in iTunes; it’ll be because of more great content. Serial tells us something for sure, but it’s something we already knew. Content is king. Despite being a heavy podcast listener, I’m still short on podcasting in the long run. It has been a convenient medium for the last few years and likely will be for awhile, but eventually the medium will be replaced with something new. Take satellite radio for example. When it debuted one of satellite radio’s greatest competitive advantages was the ability to stream hundreds of channels filled with music, sports and talk directly to your car, no matter where on the road you were. Fast forward to today and the pervasiveness of high-speed wireless networks changes things for satellite radio. Not to mention the mini-mega-computers in all our purses and pockets. The “satellite” in satellite radio just doesn’t matter anymore. XM/Sirius has to rely on – you guessed it – content in order to succeed. Not a believer? Just ask Howard Stern about his $500 million contract. The content is what makes Serial what it is. And content being the main draw is nothing new, right? However, there are a couple follow up lessons to take away. This Thanksgiving, travelers everywhere downloaded the whole Serial series to date, listening to as much as they can in a single sitting while stuck in traffic on I-95. I’m jealous of them in a way. I’ve been listening week-to-week since the start and have painfully had to wait 7 days each time a new episode wraps up. This feels like a phenomenon that Netflix has enjoyed recently. Remember when House of Cards’ second season came out? Raise your hand if you watched the whole season in a week. Or even, what about in the first 24 hours?!? However, this isn’t really a phenomenon. I remember binge-watching my first TV series back in 2005 when I plowed through the entire first season of Lost, rushing to finish it before season two started. This was before DVR in our houseof course. Going further back, my friends and I used to binge-play video games when they hit the market. When we saved up for our first copy of Street Fighter the Playstation was more often than it was powered down the first week. So while content binging is happening again, this time with podcasts, and marketers would do well to take note (as “Mailkimp” already has!). Speaking of marketing, the second lesson learned from Serial is from one of the more viral components of the show. 100% free, like each episode. Another example. People no longer buy CDs. We know that. But Apple has hinted that its iTunes sales arenow dropping. In its place people are instead paying for subscription services like Pandora and Spotify. We mentioned Netflix earlier and you’ll see a similar effect there – users paying for access to an entire content library, as opposed to paying for specific movies and shows. In the meantime, and on that note, here’s your chance to help out. Serial recently announced it’s taking donations to fund season 2 so stop by and chip in if you’d like.